Our newly renovated and well-equipped cabin sits at the end of a dead-end road on three secluded acres including rolling lawn, woodlands, and a pretty pond. You probably won't hear another car all weekend. Yet we are less than five miles from Woodstock, the cultural center of the Catskills, with its galleries, theaters, festivals, restaurants, concerts, and boutiques. 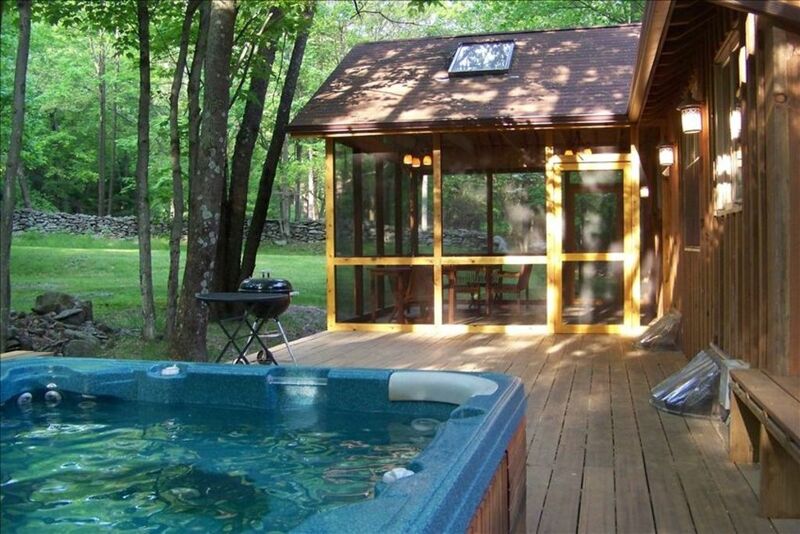 Maybe you won't get back in your car for your entire stay - you can sit on one of our large decks, or screened-in porch, or soak in the hot tub, and watch deer, wild turkey, (and maybe even a bear) stroll by. Or walk across the road for a hike on hundreds of acres of public land. In the winter, build a fire in the wood stove, or go sledding down our own hill. Or you might use our home as a comfortable base for all the cultural and recreational activities available in the area - hiking, rafting, skiing, swimming holes, are all nearby. Wi-fi included. See link below for dozens of more photos. Lovingly renovated by an artist, and filled with art, the house features new bathrooms, bedrooms, and kitchen, and tons of outdoor deck space. We're less than two hours from the George Washington Bridge - and there's even a Trailways bus stop about two miles from the house. But once you turn into our driveway, you are in another world of quiet and relaxation. If you would like to see more photos, please contact us. Beautiful, secluded setting at end of dead-end road, Art-filled home newly renovated by an artist, Piano, Hot tub, Pond on property (not for swimming), Hiking on public land across the road, Screened rear deck, Large decks front and rear, Ceiling fans throughout, Sit on the deck and watch deer, wild turkey, (and maybe even a bear) stroll by. 55" UltraHD Internet Television with Netflix, Amazon, etc. (no cable or satellite - bring your laptop to stream content to the TV.) Wi-fi, SiriusXM satellite radio, and a stereo system for your iPod or CDs.) Property is a mix of lawn, woods, and pond area, bordered by beautiful old stone walls. House stays cool in summer. 55" UltraHD Internet Television with Netflix, Amazon, Hulu, etc. (You'll need to log in with your own account.) No cable or Satellite hookup. HDMI cable provided to stream content from your laptop. XMSirius Satellite Radio and stereo system with CD player and iPod jack. Belleayre mountain -- about 25 minutes drive time. Hunter mountain -- about 35-40 minute drive time. Public tennis courts nearby in Woodstock (Andy Lee field) and Boiceville (Onteora Central School). Woodstock Tennis Club may also have public hours. Beautiful, secluded setting at end of dead-end road, Art-filled home newly renovated by an artist, Piano, Hot tub, Pond on property (not for swimming), Hiking on public land across the road, Screened rear deck, Large decks front and rear, Ceiling fans throughout, Sit on the deck and watch deer, wild turkey, (and maybe even a bear) stroll by. 55" Internet TV (no cable or satellite), wi-fi and SiriusXM satellite radio. Property is a mix of lawn, woods, and pond area, House stays cool in summer. PLEASE NOTE: Unfortunately, the automatically-generated price quote is often erroneous. Please contact us for an accurate price quote. Please do not use the "Book it Now" feature, as this seems to often cause problems. Rental fee is NON-REFUNDABLE unless we are able to re-rent dates. Surcharge applies for groups of more than 6 adults. Surcharge may apply for holiday periods including Thanksgiving, Christmas, New Years, Memorial Day, Independence Day, Labor Day. 50% of rental and cleaning fee due at time of booking. Balance & $400 refundable damage deposit due 30 days before start of rental. Paypal accepted.